As I write this, I haven't quite made up my mind about the breathy, ethereal actress known as Rekha - she's a little too intense and creepy for me to find her really beautiful - but when I saw Umrao Jaan, I understood why she was a superstar. Rekha was born to play the title role in this melancholy classic film. Set among the elite Muslim society in mid-nineteenth century northern India, Umrao Jaan portrays a romanticized version of a tawaif, a kind of courtesan who has something in common with Japan's geishas. Tawaifs were accomplished in the high arts of kathak (north Indian classical dance), poetry, and music. The film's Umrao Jaan, sold to a brothel as a young girl, excels at all three, and becomes the most sought-after and famous tawaif in the region. But in spite of all her accomplishments, Umrao is never happy, and while she can find some measure of escape in crafting her much-admired poetry, she longs to extricate herself from the world of the tawaif. She works her way through a brief series of lover/patrons, hoping each one will be her ticket out of the degredation of brothel. Needless to say, freedom is not Umrao's lot, and after each attempt at escape - literal and metaphorical - she finds herself right back where she started: Umrao Jaan the famous courtesan, performing for the benefit and the pleasure of others. It is Rekha's ineffable Rekha-ness that makes her so perfect for this role, as she somehow manages to appear tired and worldly while remaining delicate and other-worldly. She carries Umrao's transition from innocence to disillusionment in her body and in her face. Umrao never loses her grace, but, as Rekha conveys, she does lose her idealism. Early on she muses that it is "circumstances" rather than "destiny" that made her a tawaif, and circumstances can change. Later on, she seems nearly broken, and the sadness just grows in Rekha's eyes on each iteration of her Sisyphean attempts to redefine her circumstances. 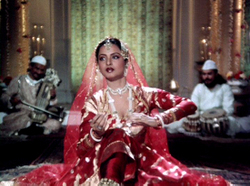 The music of Umrao Jaan is lovely and magical. Most of the songs represent Umrao's own poems as she performs them for her patrons, and they reflect her melancholy dignity throughout the film; she sings both of succumbing completely to love ("What is a heart? Take my life") and also of her own particular power ("Thousands are intoxicated by the power of these eyes"). The songs themselves are gorgeous ghazals sung by Asha Bhosle, in a performance quite different from the flirtatious exuberance of her earlier work on the funkiest soundtracks of the 70s. Here she delivers the melodies with a placid, emotive sweetness that is wonderful and a perfect match for the mood of the film. As if that weren't enough, we, like Umrao's patrons, are treated to some mesmerizing kathak by Rekha.